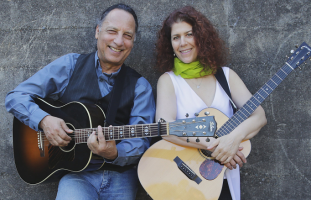 Judi Jaeger and Bob Reid travel the country with their guitars and ukulele from the SF Bay Area to share their lush harmonies, intelligent and intimate original songs sprinkled with some re-worked favorites. Prepare to be moved! Some of the best discoveries are made by accident and that’s what happened in the fusion of the musical talents of Judi Jaeger and Bob Reid. They unwittingly found that perfect harmony while standing next to each other at a music camp jam in the summer of 2015. Their musical spark quickly caught fire and was noticed by those around them – and the successful collaboration between Jaeger and Reid was born. Judi grew up near Montreal, Canada, where her world was filled with music; her mother and brother sang and played guitar and she listened to Leonard Cohen, Peter, Paul & Mary, Pete Seeger and many others. She began her performing songwriter career as an expression of her loss after the death of her mother, and has written songs for her local domestic violence prevention organization. Bob is a fourth generation Californian, and like Judi, Bob also grew up surrounded by music. Bob’s mom performed in coffeehouses in the 1960s, while his father was a gospel concert promoter. Bob has been a California Arts Council Artist-in-the-Schools, performed at the United Nations in New York, in concert, at festivals and in schools across the United States. His original songs have been sung by Pete Seeger, Bill Harley, Cathy Fink & Marcy Marxer, and many others. Bob was chosen by the Seeger family to perform at memorial concerts for both Pete and Toshi Seeger in New York. In his writing, Bob has a keen eye for musicality, empowerment, appreciation of nature and social causes.